You might want to send mail from command line in Linux for logging or sending mails automatically for some purpose, obviously not for spamming. In this tutorial we're not installing or configuring a SMTP server, instead using Gmail's already configured and secure SMTP server. As we're using Gmail for forwarding mails through it's SMTP server, obviously we need a Gmail account. But it's up to you, you could whatever mail service, as example Yandex Mail, if you like. There's nothing much to configure with gmail, just enable access to some apps, which Google considers as "Less Secure". 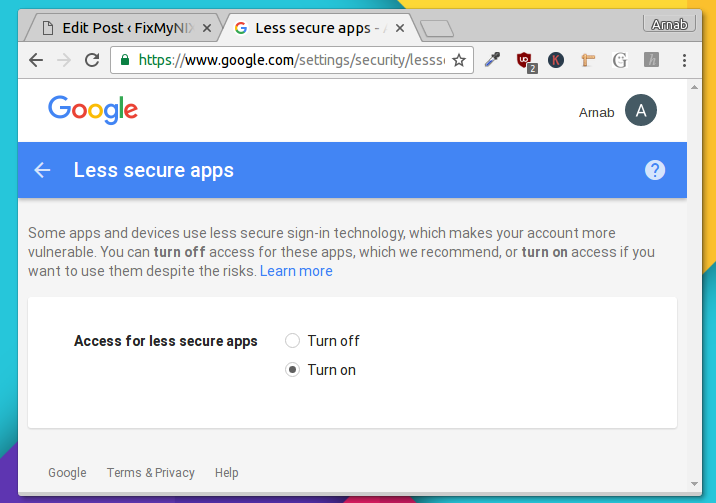 After logging in to Gmail, go to this URL and turn on Access to less secure apps. I think other mail services also require something similar, to increase their user's security. You've to configure some more if you're using two factor authentication. The next step is to install a MTA(message transfer agent), and here we're going to use sSMTP , it's for only sending, it could not receive mails. Note: In OpenWrt prbabbly you've to configure extroot, as sSMTP's dependency libopenssl consumes around 1.7 MB. The sSMTP configuration file is /etc/ssmtp/ssmtp.conf, you've to customize it according to your credentials. Use the man ssmtp.conf command to know more about configurations. There are many command line utilities to send mails, and in many flavor too. Using the mail command in any Linux distro, it's available as mailutils in Debian or Ubuntu. mail -s "System Log" -A /var/log/syslog [email protected] < "test_body"
Modify the command above according to your need. Using the mpack command, it's good for scripting. This will send mail with the current timestamp in the mail subect, the /var/log/syslog file will be sent as attachment. You can also use the ssmtp command too, if you want to type a bit long text. This command is extremely useful for scripting, fits well with crontab entries, and this time you don't have to configure a MTA like previous commands. Install mailsend in OpenWrt, probably you've to configure extroot this time too. Another example with gmail's SMTP server, but this time port number 587 with TLS authentication. To know more about mailsend, use mailsend -help and mailsend -example. Thanks for this tutorial. I'm trying install mail, mailx, sendmail in, opensuse server and fedora server but not working. Now trying with ssmtp, but in opensuse not is functionally.